de Havilland DH.110 Sea Vixen ("Morska lisica") je bil twin-boom palubni reaktivni lovec iz 1950ih. Letalo je zasnovalo podjetje de Havilland, prvič je poletel 26. septembra 1951. Edini uporabnik je bila britanska Fleet Air Arm (letalski oddelek Kraljeve mornarice). Sea Vixen je ostal v uporabi do leta 1972. Sea Vixna sta poganjala dva turboreaktivna motorja Rolls-Royce Avon, ki sta mu omogočala hitrost Mach 0,91, v rahlem spustu je lahko presegel hitrost zvoka. Podatki iz The Great Book of Fighters; Green, William and Gordon Swanborough. The Great Book of Fighters. St. Paul, Minnesota: MBI Publishing, 2001. ISBN 0-7603-1194-3. Birtles, Philip. 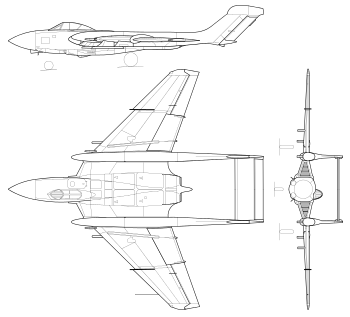 Postwar Military Aircraft 5: de Havilland Vampire, Venom and Sea Vixen. London: Ian Allan, 1986, ISBN 0-7110-1566-X. Birtles, Philip. "Sea Vixen: Britain's first missile specialist". Air International, April 1991, Vol. 40, No. 4, pp. 194–201. Stamford, UK: Key Publishing. ISSN 0306-5634. Fiddler, Brian. Sea Vixen. Ilchester, Somerset, UK: The Society of Friends of the Fleet Air Arm Museum, Fleet Air Arm Museum RNAS Yeovilton, 1985, ISBN 0-948251-03-4. Hobbs, Lt Cdr David. Aircraft of the Royal Navy Since 1945. Liskeard, UK: Maritime Books, 1982, ISBN 0-907771-06-8. Jackson, A.J. De Havilland Aircraft since 1909. London: Putnam,, Third edition 1987. ISBN 0-85177-802-X. McCart, Neil. HMS "Centaur", 1943-72. Cheltenham, Gloucestershire, UK: Fan Publications, 1997. ISBN 978-0-9519538-9-1. Neal, Molly. 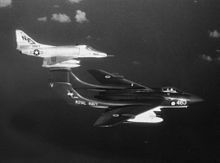 "Sea Vixen." Flight, 5 February 1960, pp. 179–186. Phipp, Mike Bournemouth's Airports - A History. Tempus Publishing, Stroud, Gloucs, 2006, ISBN 0 7524 3923 5.